The VBA InputBox function is useful for obtaining a single piece of information typed by the user in Excle 2016. That information could be a value, a text string, or even a range address. This is a good alternative to developing a UserForm when you need to get only one value. The InputBox function accepts the arguments listed here. When you execute this VBA statement, Excel displays this dialog box. Notice that this example uses only the first two arguments and does not supply a default value. When the user enters a value and clicks OK, the code assigns the value to the variable TheName. The InputBox function displays this dialog box. The following example uses the third argument and provides a default value. 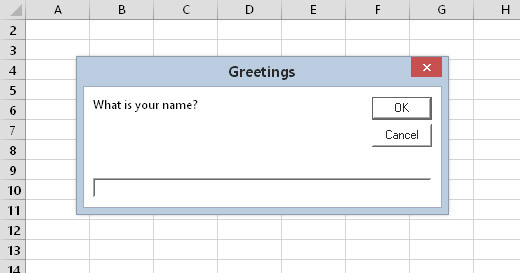 The default value is the username stored by Excel (the Application object’s UserName property). The InputBox always displays a Cancel button. If the user clicks Cancel, the InputBox function returns an empty string. VBA’s InputBox function always returns a string, so if you need to get a value, your code needs to do some additional checking. The following example uses the InputBox function to get a number. It uses the IsNumeric function to check whether the string is a number. If the string does contain a number, all is fine. If the user’s entry cannot be interpreted as a number, the code displays a message box. Check out the dialog box that this routine produces. Another example of using the InputBox function. The information presented here applies to VBA’s InputBox function. Microsoft seems to love confusion, so you also have access to the InputBox method, which is a method of the Application object. Using the Application InputBox method to get a range. In this simple example, the code tells the user the address of the range that was selected. In real life, your code would actually do something useful with the selected range. A nice thing about this example is that Excel takes care of the error handling. 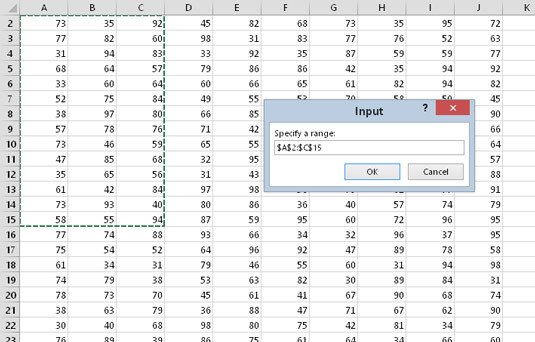 If you enter something that’s not a range, Excel tells you about it and lets you try again. The Application.InputBox method is similar to VBA’s InputBox function, but it also has some differences. Check the Help system for complete details.